Wind power generation cables connect the primary generator motor in the turbine nacelle with the transformers and relay the electricity produced to the power grid. The cables must be highly flexible so that they are not damaged even if the generators rotate thousands of cycles. 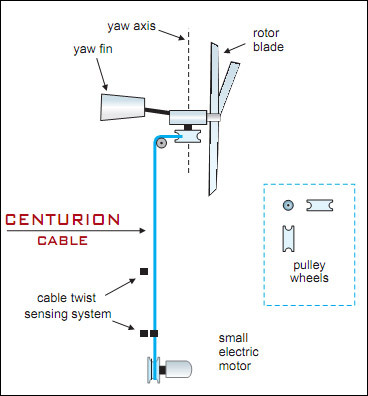 The Flexibility of the wind power generator cables developed by CENTURION POWER CABLES PVT. LTD. has been improved greatly in comparison with competitors, products. the cables have all passed 15,000 cycle rotation tests to quality for requirements of the European wind generation industry, which demand a high durability of 10,000 rotation cycles for more than 20 years. This products incorporates several environmental friendly features such as non-toxic burn resistant materials that are difficult to ignite and do not release harmful fumes on fire, These features will enable this product to lead the global wind generation power cable market in the future. The diagram shows the turbine yawed to the position where its power cables are completely untwisted. In this case, the cable that untwists the yaw system attaches to its topmost pulley wheel in such a way that it is not wrapped around that topmost pulley wheel at all. (The topmost pulley wheel is the one with the axis of rotation that is coincident with the turbine's yaw axis). Now as the turbine yaws, it doesn't matter which direction the turbine waws in, Whichever way the turbine yaws, it wraps the untwist cable around the topmost pulley wheel, and in so doing it draws the twist sensing component that is attached to the untwist cable (colored purple) up to a higher elevation. When this part of the sensor passes close by the topmost twist sensor component (colored red), the control system knows that the power cables are twisted up. To untwist the turbine, the controller simply turns on the small elwctric motor at the base of the tower until the cable mounted twist sensor component passes by the lowest red colored twist sensor component, then turns the motor back off. If the system fails for some reason, the result is that the small untwist motor will burn up or blow a fuse - a minor repair indeed. The controller might wait until the wind isn't blowing before untwisting the power cables.